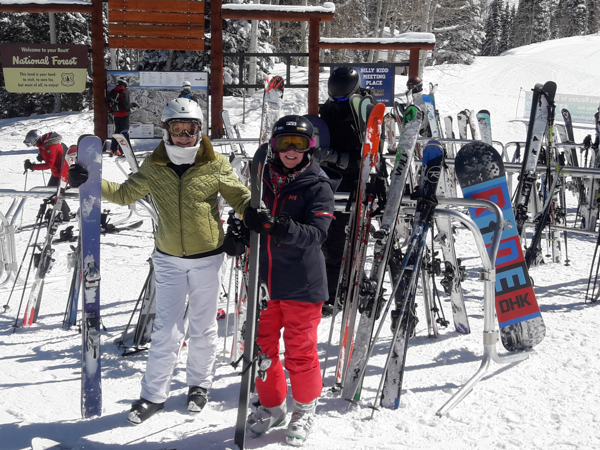 After a fun but frustrating trip to Snowmass in January, we were excited about our second excursion to the mountains in March. I had been cleared by my bone doctor to ski and Jim was looking forward to exploring another Colorado town. 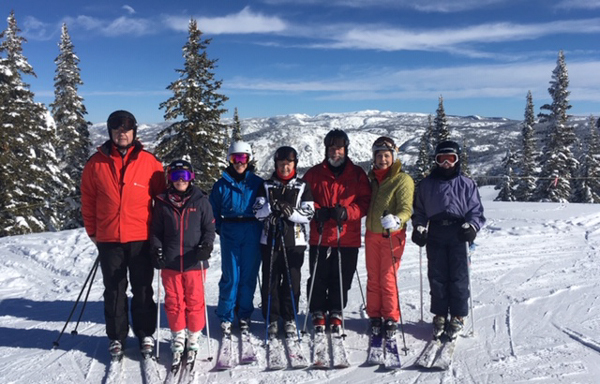 Skiing after a major injury and four months of relative inactivity turned out to be as much of a challenge as the doctor had warned, and Jim didn't get as much exploring done as he had planned, but it was still a fun time with our ski club friends. Our trip from home started out in the snow! Kerry & Marianne Hines had invited us to spend the night at their place in Markham so that we could get the bulk of our drive out of the way. We could carpool to the airport for our early morning departure. Jim & I left home an hour earlier than we normally allow because of the weather. It was a miserable drive, but we made it. I'm sorry I didn't get a picture at the Hines' because it was a winter wonderland. One complication for both skiing and exploring was the weather. 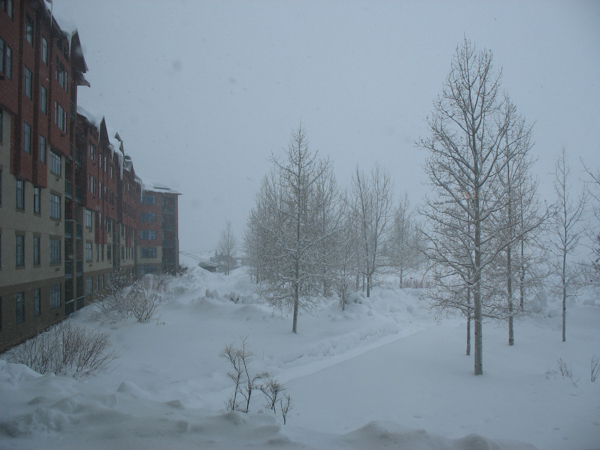 Much of the time we were in Steamboat, this was what we experienced. The upside? We had plenty of snow. The natives told us that it wasn't really what they would call "champagne powder," but it was close enough for us easterners. Most of the skiers signed up to spend the first morning with the Mountain Masters. Fred and his partner, whose name I can't recall, led us to untracked stashes of fluff and gave us a good orientation to the area. I had been concerned about something this strenuous in my "debilitated" state, and those concerns were justified, but I survived and still had fun. I took the next day off to nurse muscles I had forgotten I had! My next morning on skis was a rare time of sunshine. L-R: Kerry, Cara, me, Marianne, Barry, Rosemary & Kathy. It's so much easier to ski when you can see where you are going! It wasn't just ski-ski-ski. 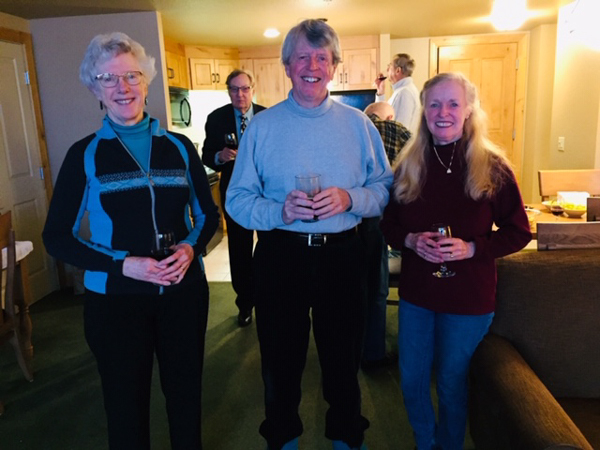 Every evening we gathered in Cara & Bob's "common room" for après ski or dinner or both. Chef Cara cooked paella for one dinner and chicken marsala for another. One night we had leftovers, but somehow it seemed that we ended up with even more food that we started with. The other nights we gathered to venture downtown for dinner. We enjoyed grill-it-yourself steaks, tapas, Mexican food (and margaritas), and an elegant four-course banquet for our last evening. 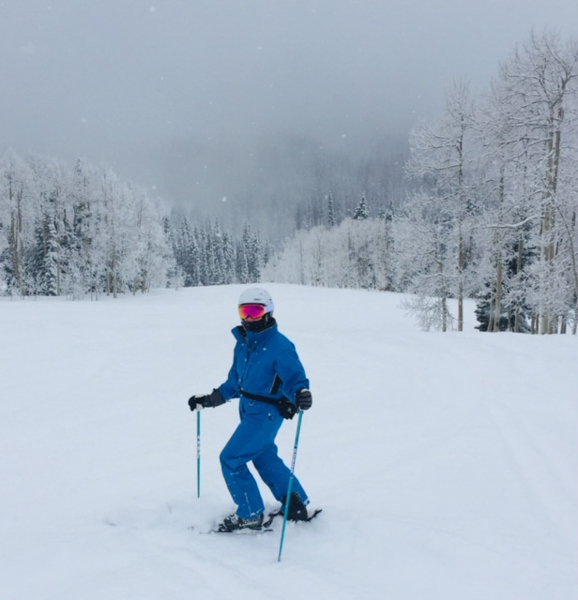 It's hard to lose weight when skiing with PVS! L-R: me, John & Kathy. Picture courtesy of Rosemary Schwartzbard. I again took a day off after the sunny morning, but was back on the slopes for another day of touchy-feely skiing in the snow & clouds. Rosemary and I split away from the others and found a beautiful stash of fluff that we had all to ourselves. West Virginia may be "almost heaven" but this was for sure heaven for the two of us. We didn't really care whether we could see it. I hear that one-piece suits are coming back into style ... as are fanny packs! 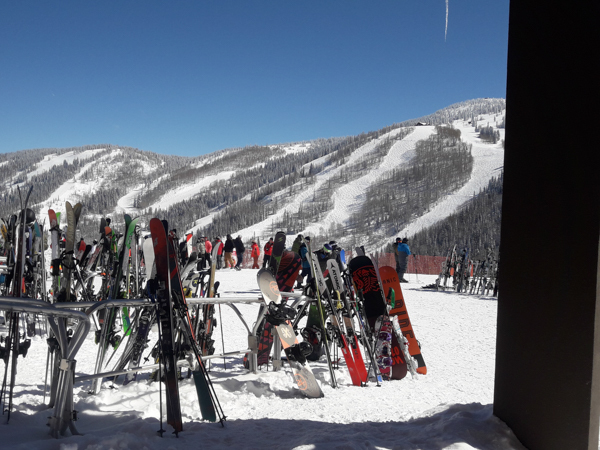 Couldn't prove it by the skiers at Steamboat Springs, however. I was amused by one of the workers at the ski check place. He looked at my 40+ year old poles and my brand-new skis and commented that they didn't really go together. I told him that skis and boots may come and go, but if anything happens to my "custom" K2 poles with Scott grips, I would sit down and cry. Picture courtesy of Rosemary Schwartzbard. The last day dawned cloudless and cold. Perfect skiing weather, but I was skied out for this trip. I took the gondola up to meet my pals for lunch, and wandered around a bit for some pictures. The gondola takes skiers up about the first half of the area. The views are breathtaking ... now that we can finally see them. Looking up the mountain from the top of the gondola gives an indication of the terrain. This is only part of the rest of the area. After lunch I wished my friends a great final afternoon. Rosemary (L) had promised Cara she would ski the black bumps with her that afternoon. Cara is much more adventurous than the typical PVSer. 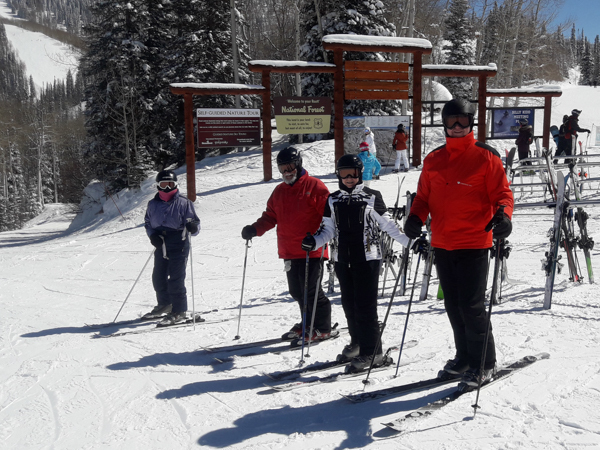 The rest of the gang (L-R: Kathy, Barry, Marianne & Kerry), on the other hand, were in search of slopes with "no speed limits." 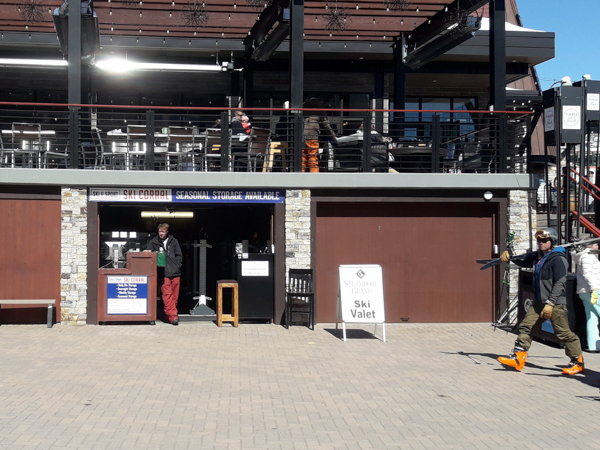 I took the gondola down to pick up my skis and boots. Our hotel, the Steamboat Grand, was not ski-in-ski-out, but it did provide a ski-check facility adjacent to the gondola. The boot check room was closer to the hotel. 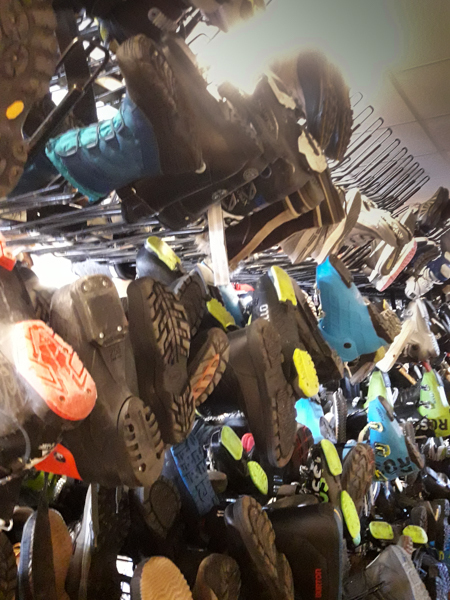 It was nice to pick up boots that were warm and dry every morning. It was even nicer not to have to slog down the hotel corridors encumbered by boots and skis! 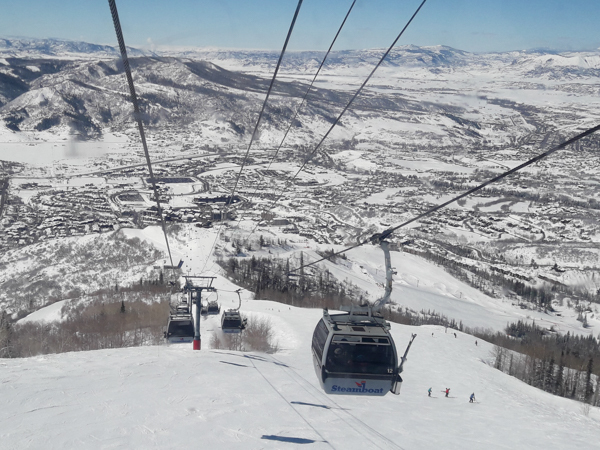 I had wanted to visit Steamboat Springs for many years and I'm glad that we had the opportunity. Bob & Cara Jablon led a marvelous trip and coordinated a million details to make sure we had a grand time. Now I'm looking forward to next year, when I plan to be hale and hearty enough to ski all day, every day.